French officials now say the black boxes of the Yemeni Airbus 310 that crashed off the Comoros Islands have not been found. The French army says a signal detected from the debris of the downed plane was from a distress beacon and not one of the plane's black boxes. Commander Bertrand Mortemard de Boisse has told The Associated Press that the frequency of the signal detected corresponded to one of the plane's distress beacons. Earlier Wednesday, two top French ministers had said one of the black boxes from Yemenia Flight IY626 that crashed early Tuesday had been found. A bruised teenage girl who is the only known survivor of the crash clung to wreckage for more than 13 hours before rescuers found her floating in the Indian Ocean, a French official said Wednesday. 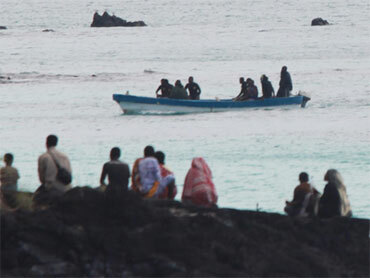 The Yemenia Airbus 310 jet was carrying 153 people to island nation of Comoros when it crashed into the sea early Tuesday as it attempted to land in the dark amid howling winds.